A “free” vote on Capitol Hill is one without negative consequences. Republicans and Democrats can line up with party activists and showboat without risk because they will be unsuccessful. Hard decisions can be sidestepped and political posturing is easy when negative consequences are blocked by the U.S. Constitution’s separation of powers. Republicans have proven to the party faithful their sincere opposition to Obamacare by voting against it over fifty times. They were free votes because opponents couldn’t override a Presidential veto. When conservative activists turned to the Courts, Chief Justice John Roberts bailed out Republicans from earning the wrath of millions of Americans left without coverage, facing steep and sudden rate increases. By voting against Obamacare and failing to kill it, Republicans can blame rate increases and public dissatisfaction with health care on the Democrats. Democrats on Capitol Hill demonstrated their sincere opposition to the Trans-Pacific Partnership trade pact by voting against fast-tracking it, to the satisfaction of the energized, populist wing of their party. These votes didn’t entail the loss of export-related jobs to high hourly-wage countries because the White House was subsequently (and predictably) able to cobble together enough pro-trade Democrats to join most Republicans in reversing course. 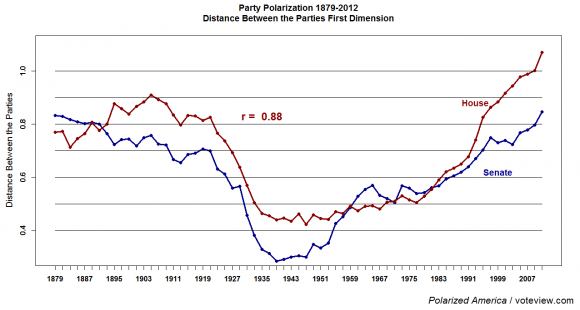 Partisan divides on Capitol Hill have become the norm. The rest of the world can look on with bemusement at divisions over Obamacare and other domestic policy issues. But when partisan divides occur on national security issues, America’s friends are not amused and adversaries look for ways to take advantage. The debate on the Iran deal now taking shape is emblematic of what ails Washington. Opposition to the Iran deal, mostly along partisan lines, is sincerely held, but the issue here isn’t sincerity; it’s the herd instinct and the absence of better alternatives. Votes against the Iran deal may be principled and cunning, but they aren’t free – even if those opposed to the deal fail to override a Presidential veto. They are not like votes on Obamacare and the Trans-Pacific Partnership. They have great consequence. As I wrote in an op-ed published by the Los Angeles Times, nothing would diminish U.S. global leadership, destabilize the Middle East, further exhaust American military forces, and weaken the U.S. Treasury more than the one-two punch of a war to rid Saddam of fictional WMD followed by undermining an agreement that effectively limits Iran’s all-too-real nuclear capabilities. Republicans, with a few notable exceptions, are nonetheless herding and gearing up to oppose this deal. If they fail to override a Presidential veto, expect a long campaign to place roadblocks against implementation. Also count on a perpetual campaign to declare Iran in violation of ambiguous provisions. And count on efforts to re-institute sanctions lifted by Executive Order. Opponents can vote repeatedly against the deal without taking responsibility for its demise – unless they succeed. If Tehran cheats egregiously and repeatedly, the deal’s failure and its consequences are on Tehran. If this deal unravels because hard-core opponents on Capitol Hill lay minefields blocking implementation, Tehran will be the principal beneficiary. If Republicans and Democrats aren’t on the same page for retaining some sanctions and lifting others, the world’s focus will be on Washington, not Tehran. The United States will be the big loser if a Republican Presidential candidate wins in 2016 and follows through on his campaign pledge to walk away from the deal. In this event, don’t count on a unified front by the P5+1. Don’t count on tougher sanctions. Do count on Tehran to re-litigate its concessions – or to blow past them. Also count on proliferation concerns growing. They are manageable with this agreement and worse without it. The skeptics have spent many months critiquing the Obama Administration. They will continue to do so for the next 60 days.This is the agreement we’ve got, and it’s surprisingly good. Implementation will be challenging, even if all parties are acting in good faith, not just because these constraints are entirely new and complicated, but because irreconcilables in Iran and the United States will favor its demise. As the immediate, over-the-top rhetoric from Republicans in congress (“akin to declaring war on Israel) makes clear, for them the politics of this vote are so easy as to eliminate the need for consideration of the substantive merits. While you make a strong case that a No vote would be damaging to the US, Mr. Krepon, this is nothing compared to the opportunity to make political arguments against Obama — and, perhaps more importantly, Hillary Clinton — that a No would facilitate. I’m not sure the 1991 Iraq AUMF is an apt comparison, as I believe those who voted against it (and I remember George Mitchell taking a leading role, do I get extra credit? ), did face a loss of credibility after the resounding military success. Even if the Iran agreement works perfectly from the US perspective, in contrast, we will not see such a clear defining moment as the Iraqi defeat and retreat from Kuwait. And my bet is that some issues, such as the PMD inquiry, may go less than perfectly. Can’t argue with you on any of these points. Nixon had his Southern strategy, aimed at while males, in particular. Republican strategists are now angling for a larger share of the Jewish vote. Alas. All opposition to this deal is “sincerely held”? Future campaign contributions are in play, Michael. To paraphrase Nixon: if the money-bags have the Congress by their happy-sacs then their hearts and minds will follow….. “sincerity” be damned. I try to respect the views of people I disagree with, when those views are sincerely held. But I will certainly grant you this: Sincerity can be accompanied by walk-around money, and cunning. Sincerity doesn’t lunge for microphones or use clever or hyperbolic arguments. Yes, there’s certainly money in these arguments. Campaign contributions are free speech — as least as a 5-4 margin on the Supreme Court has ruled. And presidential candidates are out there, trolling for billionaire backers. For a politician, a vote with negative consequences is one that would incur the wrath of voters. Among Republicans, only 41% currently support the Iran deal (69% for Democrats; 56% for independents). The Republican leaders apparently oppose a deal based on ideology alone, regardless of the deal’s merits. Such ideology comes perilously close to saying war is always honorable; peace is always dishonorable, even when peace would be better for national security. Do the opponents of a deal support a nuclear-armed Iran? Do they support war over peace? If not, why do they oppose a good deal that prevents a nuclear-armed Iran? I suspect because of lobbying as “Yeah, right” alluded to above. Politicians – in general – may occasionally go against the wishes of the people they claim to represent so long as they remain in the good graces of their funders. While I don’t doubt that there exists money and influence in politics, Republican Congressmen are pretty safe in voting no if only 41% of Republican voters support an Iranian deal. What could turn this around? Perhaps more Republican or independent leaders outside of Congress who are willing to support the deal. First, Iran won’t cheat egregiously, they’ll cheat on the margins. Iran will advance weaponization / delivery system technology without doing so on a scale which incurs major publicity. Second, the Republicans don’t trust the current administration to enforce any violations of Iranian cheating. The running hypothesis on the foreign policy right is that the administration is securing a Middle East grand bargain with Iran, wherein Iran becomes a critical component to stabilizing the region. In that situation, there is all the reason to expect any small cheating to be ignored or negotiated away. One final note of caution, the Arms Control community better pray that this deal works. If Iran proceeds on researching and eventually producing the ultimate deterrent against US intervention (nuclear arms) and the ultimate tool of national security against Israeli / Saudi counter strikes (nuclear arms), then Arms Control is dead for a generation, the road to Zero is dead for a generation. North Korea is largely self-contained via the control of China and the poverty of the nation. Iran, for all the sanctions, has been highly active in regional affairs. Adding nuclear arms will be different, as the Iranian regime is different. Just last month, CSIS released a report recommending that the F-35C, Navy variant, be fitted to carry B-61 bombs, so that the US will have a range of nuclear options which can be easily deployed around the world. This is the consequence of failure, what seems unthinkable now will become necessary in the future. 1st major complaint: You’re very certain about what Iran will do in the future. I’d be just as justified in stating that Iran will not cheat at all. Iran is allowed to have some technology. Some of it is worrying, which is why the IAEA will be watching Iran. The US will be advancing defensive system and penetrator technology over the same 10 years. 2nd major complaint: I’m shocked. Is there evidence that the Obama admin is secretly plotting to turn the mideast over to a newly powered up Iran? My current hypothesis is that the foreign policy right, like the rest of the right, is looking for anything to use to trash the current president. Assuming it’s true… so what? If Iran becoming a regional power that creates some stability in the Mideast, how does that harm US interests? Saudi interests? Sure. Israeli interests? Maybe. But if I recall correctly, this was why the CIA setup the Shah in the first place. And everyone should pray that this deal works, but whatever the outcome, it’s better than any alternative I’ve ever heard. As for the nuclear F-35C, this sounds a lot like making nuclear options usable, but I admit I’m not up enough on the certification debate to speak about it. I’ll ask what nuclear option the F-35C needs to fill that a B-2 or a SLBM couldn’t. One final note of caution, the Arms Control community better pray that this deal works. I think there is near-unanimity that Iran getting nuclear weapons would be very very bad. It’s not “this deal or they get them”. It’s largely “this deal, or if not and we think they’re trying for weaponization, preventive war”, although a lot of people are very uncomfortable articulating the latter in public. That is what they think and privately say. Ok, for Iran cheating, I find it highly unlikely that Iran, if it cheats, will cheat big. What would Iran gain by that? That leaves a bit of an asymmetry, small technical issue vs. detonating the deal by returning sanctions. The Iranians know that they are assured a complete nuclear cycle and have a hardened facility if the deal does collapse. Any development will likely focus on weapon design, which shouldn’t have a large footprint, and delivery systems, which has seen the sanctions disappear. What this deal may do is give Iran time to advance all other bomb components, while the international community ensures the enrichment path is secure. For the second point, this is the running hypothesis on the right. The President sees Iran as being a counter balance to Saudi power and a possible stabilizing / counter-ISIS / Al-Qaeda force in Iraq, Syria, and Yemen. I see that you implicitly agree with this argument, but you don’t quite get the implications: the US will be reluctant to push minor issues, because the need to maintain a general détente, to encourage regional superiority. Furthermore, the above idea ignores the possible ideological nature of the Iranian government, which may, or may not, be important. Finally, on the F-35C, the argument advanced was that the US needs a tactical nuclear capability to deter regional nuclear powers. F-35A will carry that, but F-35C should be cleared as well, to give more strategic flexibility. I didn’t know that the Arms Control community thought that it was this deal or war. That seemed to be more o a political tool to encourage signing up to this deal, or almost any deal, as almost anything is better than war. Perhaps it would be reassuring if the Arms Control community established, publically, the rhetoric that at some point war is preferable to a bad situation. Of course, the President is compromised because of his Syrian Red Line, so it would have to be someone with greater trustworthiness. On matters of war and peace, the arms control community ranges from passive to aggressive, so no, they won’t agree on a common policy of war. On the passive side, if Iran races for a bomb, we should just reinstate sanctions, and if they get a bomb, simply rely on nuclear deterrence to dissuade Iran from ever using it. On the aggressive side, bomb Iran with conventional weapons, and if they ever detonate a nuclear weapon, with nuclear weapons and/or conventional weapons plus regime change. A President will generally keep all options open, until the issue must be decided. Iran can get a basic HEU bomb right now. Could have done it long ago. They have centrifuges, they have hex, there’s nothing stopping them technically. If they think they need nukes to survive, they’ll get them. You can’t expect anyone to go quietly into the night. But they haven’t broken out, and if they didn’t when they were getting sanctioned half to death and when everyone hated them, I can’t see why they’d cheat once things got both *better* diplomatically and economically, and *harder* with respect to breaking out. Being able to hold onto the hint of a breath of a possibility of a breakout is always going to be necessary for Iran, at least for the foreseeable. They heard “axis of evil’, they saw the countries to either side get roflstomped, and they saw a pissweak North Korea sitting pretty on their kinda-sorta-probably nukes. Iran needs to hold on to just the future potential of a nuclear capability to reinforce their conventional power as insurance against a nut job winning an election in the US and deciding a good ol’ war would go down well. If you were Iran, and you saw the Republican primaries, wouldn’t you sweat just a bit? It’s entirely rational for them to keep a breakout as a future possibility – but it’s equally rational to NEVER break out, as long as they don’t absolutely need to. With all due respect to all. The elements of fairness and balance is missing in this discussion. The dominant theme in this debate seems to portray (Iran only) as (to be) a cheating party. contradicting your own initial analysis? Aren’t you folks using and abusing the Iranians as cheating no good, devious up to no good outlaws? Even though this agreement is based on VERIFICATIONS, not trust. If that’s the case, shouldn’t we all join the war-party in their valiant effort to stop this disgrace? Frankly, why should Iran trust any pact, treaty or agreement when it’s always the party blamed for all wrong even when we violate our commitments. Such violations ensued after president Regan signed the Algiers agreement in 1980 promising none-interference in Iran internal affairs (we abandoned our pact by siding with Iraq, supplying Saddam with Chemical weapons, pinpointing Iranian military and other targets for Iraqis to attack), then our fifth fleet started attacking Iran’s naval units in 1988 under the pretext of deterring Iran’s attacks on the re-flagged Kuwaiti ships, which were actually Iraqi ships and tankers, thus, fair game for the Iranians to interdict). The western violations against Iran covered dozens of agreements signed between Iran and France, Iran and Germany, as well as Italy and others all thrown out unilaterally by our allies. In these instances tens of Billions worth of Iranian property and assets were taken over by the named countries. Iran got nothing back when they protested about these violations as they had no recourse. Consequently, they did get the middle-finger when they kept complaining. Now, after lengthy negotiations and agreement, we’re crafting scenarios on how and when we could catch Iran’s cheatings on the margins? Are we really beyond cheating and double-crossing Iran? No one seems to even consider what if we cheat and screw Iran, then strong arm IAEA to blame Iran for manufactured violations that Iran couldn’t possibly refute, then renegotiate some more to extract further concession from Iran. It does seem very practical method to amend the pact since we don’t like it. Could anyone discuss this aspect? . . . . . . . I doubt it. Remember that this forum has two frequently clashing goals. One the one hand, it’s sort of a place where arms-control professionals can publish their thoughts for one another free from the creativity-crushing demands of academic sourcing and record-keeping. I like to think of it as a place where professionals can skim the surface of open-source technical thought, and use the occasional public insight to fertilize some germinating idea that may eventually find its way into publication. In that respect I think it’s been quite successful, at least to the degree visible from the outside. I’m no longer in the field, so what I consider useful kibitzing might no longer be seen that way. On the other hand, it’s a place where a dozen or so other internet people can carry on a decade-long culture war in the view of those professionals. The same people have been typing basically the same four paragraphs here at least since… 2006? I can’t even remember, although once you’ve spent enough time reading the site, you recognize the participants, regardless of their changing pseudonyms. This current argument (which at its base, is over whether Persians or Jews are more EVIL) is just the latest face of a struggle that has morphed enough times to make one a believer in eternal recurrence. My own position is that I certainly don’t expect the Iranians to trust us! Trust, like fairness, justice and balance, is a concept for little children and television advertising. I expect the Iranians will decide to cheat or not, based on the same forces of pride, fear, greed and hate that motivate us, them, you, me, and every human who has ever lived or ever will. To confuse the value of ‘us’ cheating on a treaty with the danger of ‘them’ doing so, is to forget the ‘meaning-through-use’ of words like ‘us’ and ‘them’, and the critical difference between them. We don’t seek victory because they’re evil, we do it because they’re ‘them’. All else is advertising. This agreement is what it is. Nothing about it requires trust or love, or mistrust or hate. It’s entirely possible that everyone’s position as exemplified in the agreement is not only honest, but justified and reasonable. Iran wants a domestic fuel-cycle, which is fine, and others want to be assured it’s not a weapons program, which is also fine. Of course people have motivations that underlie their positions. But as long as the outcome is mutually profitable, you don’t need to trust anyone, only to assume that yes, they’ll do the thing that benefits them. Right now it is in everyone’s interests for this agreement to stand. The day that stops being true, the agreement is over. But that’s life, and we’ll live it when it happens. Instances of clear-cut cheating are actually rare, such as German rearmament after WW I and the Soviet radar near Krasnoyarsk in violation of the ABM Treaty. Most of the time, allegations of cheating have much to do with ambiguous provisions or provisions on which the parties have differing interpretations. Some might call this cheating at the margins. But the margins are fuzzy — either purposefully or inadvertently. Cheating can also be in the eye of the beholder. Those who are strongly opposed to an agreement are inclined to find cheating, making long lists of transgressions. This happened quite a bit during the Carter and Reagan administrations. If the Iran deal goes through, I expect opponents to find cheating at the margins — their preferred margins. It will take much fact-finding to determine whether real, as opposed to perceived, cheating has occurred. But critics will have made up their minds without waiting for these investigations. Much depends on whether a Republican or Democrat wins the White House in 2016 and 2020. If a Republican administration decides to trash the agreement, it could use allegations of cheating to help articulate this case. Lately, chief amongst them; David Albright. One must constantly be wary of confirmation bias, as over a given time and evolving input, sadly, it always has to either end with weaponisation or limited weaponisation (the decision to pause r&d) – This is true for any country that engages in nuclear research. And by the past few years; it’s a shame when I see people critique, and not distinguish that the later choice – is compliance, non-proliferation. Iran was well-represented by a smart group of negotiators who were keenly aware of potential critiques from hard-line skeptics within Iran. I believe Iran has already done what it can to take care of itself in this deal, including the possibility that one or more Western nations might try to “cheat” on their end of the bargain. Among other provisions, various obligations by Iran are strictly time limited. In addition, the group of 8 requires a vote of 5 to sanction Iran. 5 of these votes are Western: U.S., Britain, France, Germany, and E.U. If a charge against Iran is trumped up, Iran can probably count on support from itself, Russia, China, and at least one of the 5, thereby defeating the sanction. Moreover, Iran is mainly concerned with ending the multi-lateral sanctions, not unilateral U.S. sanctions. Even if the U.S. Congress or a future President completely trashes the deal, Iran gets most of what it wants by continuing to uphold its end of the bargain with the remainder of the deal makers. This current argument (which at its base, is over whether Persians or Jews are more EVIL) is just the latest face of a struggle that has morphed enough times to make one a believer in eternal recurrence. Maybe be you’re correct, but I tend to be more optimistic. I have been a regular reader of ACW analysis since 1994 or earlier. I never doubted the integrity of the contributing specialists. Furthermore, I don’t believe ever writing or replying to any discussion. The Iran nuclear file was an exception by reason of too much media coverage, as well as political posturing from both democrats and republicans. So, I wrote two replies lately. I was trying to better understand our perpetual fixation by this issue and the constant depiction of Iran as the constant fraud. The Iran nuclear file morphed into a global issue (by constant media hype, which is a long story to discuss), thus, it’s not whether Persians or Jews are more EVIL, it’s about who’s damaging the process to resolve this crises (a manufactured one, of course). I am not naive to think that arms control issues associated with trust. Also, seeking victory has nothing to do with good or evil, as well, it us against them. My questions about cheating in general evolved around what if any member of the 5 powers driven by political pressure decided to re-interpret or cheat the Iranians during the 10-15 year period? Why preclude an argument covering this aspect, while debating Iran’s cheating scenarios? –The GOP is going to vote to kill the deal. –There is no way they will lose that vote. –Therefore the deal-killing bill will go to the President, who will veto it. –I cannot stop that from happening, so I might as well get the benefit of saying I voted against the deal. –I can then vote to uphold the veto, if the whip tells me my vote is crucial. The first vote is free; only the second is not. That is precisely the kind of short-term transactional, PR-guided thinking that congress specializes in. So I believe we’ll wind up with the scenario Mr. Krepon lays out. Telling a representative of either party they need to cast an unpopular vote because of how it will affect foreign perceptions of America is a sucker’s game. Only convincing them their particular constituency (and donor pool) are OK with a vote for the deal will influence them. The ideal would be no vote at all, or a purely symbolic measure that would in fact be a free vote. I think the only way to get that is for a minimally sufficient group of Dems to pledge, before the initial vote, to uphold any veto. That lowers the stakes for the debate to the point where all observers, including those overseas, see the first vote for the “free vote” charade it is. A man who knows a few things about Capitol Hill. If I understand correctly your argument is this: if a sufficiently large “group” of Democrats pre-announce that they will not allow a Presidential veto to be overturned then the entire process is rendered moot. The Congressional vote will still take place, sure, but everyone will understand that it is nought but an exercise in pointless grandstanding. The problem will be that this “group” will be inviting lobby organizations like AIPAC to play a very targeted version of whack-a-mole on them. After all, that such a “group” would make the vote of Congress-as-a-whole irrelevant has a corollary i.e. lobbyists opposed to this Iran agreement will understand that they must break that “group” using fair means or foul. Would you be confident that such a “group” would hold firm once the blowtorch is applied to the belly? Your assessment is precise, and I tend to agree with your interpretations. I have been following the Iran nuclear file since late 1980s while still a student during which Iran started the Uranium processing plant in Isfahan. Since. I read enormous volumes of studies (so-called) related to this issue, while remaining abreast of Iran’s nuclear issues. I find your coherent views to be among a hindmost selected few assessing this topic with depth, fairness and neutrality. Chances are that Murphy law (#1) could be a factor in congress’ desperate attempts to sabotage the agreement. By September when congress starts the voting process, the international sanction regime could be past tense. Thus, the congress ought to have much less leverage to actually influence the implementation of the agreement. Theatrics aside, the US congress have no relevance to this agreement, so the spectacle in September serves only as a reaffirmation of loyalty by the ones who owe the big lobbyist their place under the sun, thus, they must stand in line and have their finger prints taken. The disbelievers and the war-party will vote no, but no veto-proof majority. In consequence, pursuing the issue in order to create a hurdle no longer practical. Mr. Kerry and the Iranians accomplished a fait accompli by demanding the UNSC to ratify the agreement first to forestall the congress from committing any reckless act. Therefore, for the majority in congress pursuing the issue sounds like a political recipe for disaster, but for the dead-enders that’s almost not detectable. I am confident of nothing, except that, as a technical agreement on the means to keep Iran away from a certain military and technological threshold, the agreement is as sound and as verifiable as it needs to be. How it will play out? Who knows. A part of me thinks that the pressure on supporters of the agreement will not actually be all that great. They have the experts on their side, including, I expect, military and intelligence officers both serving and retired, as well as the voices of our negotiating partners. And the alternatives, if they are anything like Ambassador Oren’s op-ed, are terrible. I think a steady program combining reiteration of and focus on the (very good) technical facts, political hand-holding, rounding up PAC and donor promises/threats on the pro-agreement side, and opposition that is at least in part less fervent than it appears will be enough. Moreover, if Obamacare was not overturned, why would this agreement be? The base was literally as fired up about that as about any issue I’ve ever seen, and — partly because no plausible alternative was ever offered — repeal was never remotely likely. The fact that no plausible alternatives are being offered here to me means the Nos are not seeking — and can not get — middle-road votes, they know it’s going to pass, and the core that supports the deal will not suffer that much. Will some dems defect? Sure. But not too many. I am … hopeful.